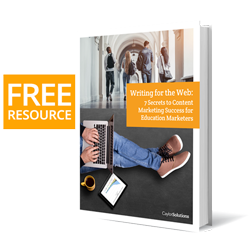 If there were one thing that could both elevate or kill your higher education marketing efforts, it would be brand awareness. Every marketing strategy should begin here for the simple reason that if consumers aren’t aware of your brand, they can’t engage with you. Brand awareness is how aware your target audience is of your organization—who you are, what you have to offer, and what is important to you. Because it’s so critical to your success, raising awareness should be the first goal of every marketing effort with the ultimate goal being to convince the prospect to take the desired action. But brand awareness is much more than letting the prospect know you exist. It’s also about how much they’re listening to you. In other words, is your target audience paying attention to you? After they know you exist, they need to care that you exist because they believe you could have some answers for their perceived problem. It’s a noisy world out there. Brands are competing for the attention of consumers like never before. One example is advertising juggernaut Coca-Cola. They spent $3.499 billion in 2014, and have plans to spend even more in years to come. Reminds me of a scene in that old movie Sister Act 2, when Sister Mary Clarence (played by Whoopi Goldberg) first enters the classroom and is met by the rowdy din of her disinterested students. Laughing, roughhousing, sleeping, and blaring their music from old-school boomboxes, none of the students would pay any attention to her. Sure, the students knew Sister Clarence was there—but they didn’t care what she had to say. While I’m sure your competitors aren’t spending as much as Coca-Cola on advertising per year, your marketing still needs to penetrate the noise, including the voice of your competitors. You’ve got to do more than give your audience information. You have to give them information they’re already looking for through a channel they already use to find their information. So how do you get their attention? Billboards? TV ads? Radio? All of these (and the many other channels in the digital marketing space) can be very effective to raise your brand awareness. But make sure you temper your brand awareness strategy with proper spending for advertising where your ultimate audience will be. Many choose to justify billboards and newspaper ads as brand awareness when all it does is appease the administration and board. 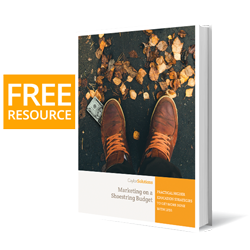 All that marketing activity makes them feel like something’s getting done, and it’s easy for them to see and get their heads around —but it doesn’t mean that your organizational goals are being reached. First, find out where your audience goes to find the answers to their questions. If the audience is a high school senior, does it make sense to spend money on newspaper ads? Not at all. Better to use the same dollars focused on Pandora or social media brand awareness. This doesn’t mean billboards and other traditional advertising channels are out. It means that you shouldn’t spend on them unless it makes sense. Surveys. Start with your current data file before buying any lists of random people. Ask them how they heard about you, how they came to decide to choose you, and what channels they use to find their answers about higher education. Web traffic. Take a look at your Google Analytics and see where your traffic is coming from. What are the primary sources of traffic to your site? Social media. Use social media “listening” tools like Tweetdeck or Google Alerts (free) or paid tools like Hootsuite and NUVI to analyze what your followers are saying about you, which of your posts they’re sharing, and other important info to show you how much they pay attention to you on social media. Post surveys like I described above in your social media channels. If you would like to know more about raising brand awareness, we’d be happy to help. Get ahold of us here. Or, if you’d like to see how we help organizations tame their web analytics, check out how we helped Huntington University.